In December 2011 Chef Morgan Meunier moved his self-named restaurant Morgan M from its long standing Islington base to Barbican. I really enjoyed the food at Morgan M during my past visits (for my previous Morgan M post, click here). But I did find the trek to the outer reaches of Islington (given its distance from the tube) a little awkward. This move to Barbican seems ideal for making the restaurant more accessible. The décor is pleasant and safe, but perhaps not as modern and slinky looking as one might expect from a Barbican/Farringdon location. The format of the menu has not changed, and I was happy to see that Morgan had kept hold of his £52 five course tasting menu. It was rather good value when you considered the quality of the cooking, the number of dishes and the fact that you could choose from two alternate dishes for each of the starter, main and dessert courses. And of course, there are the usual à la carte options for the picking. For spring, the tasting menu kicked off with a warm tomato soup with purple basil and a tomato and olive oil sorbet which was lovely and refreshing. The icy sorbet provided a nice zingy contrast to the soup and promised a tantalising start to spring. The two of us elected to go for each of the alternate dish selections to maximise our range of tasting options. But to complicate matters, I substituted the tuna tartare starter in the tasting with the mille-feuille of Cornish crab (€15.50) from the à la carte menu. 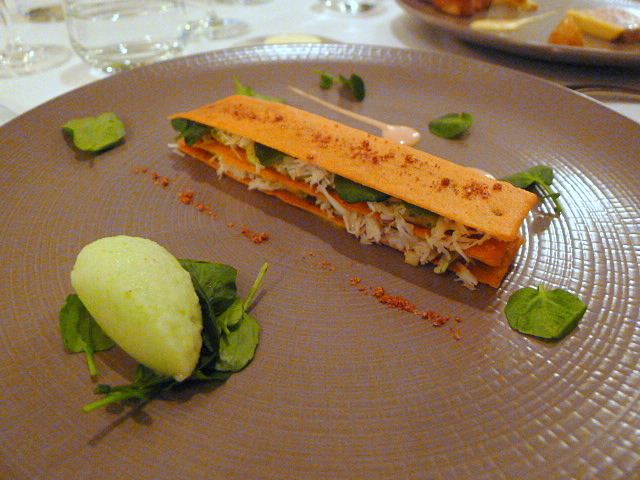 Served with apple and watercress, the mille-feuille was generously filled with fresh crab. 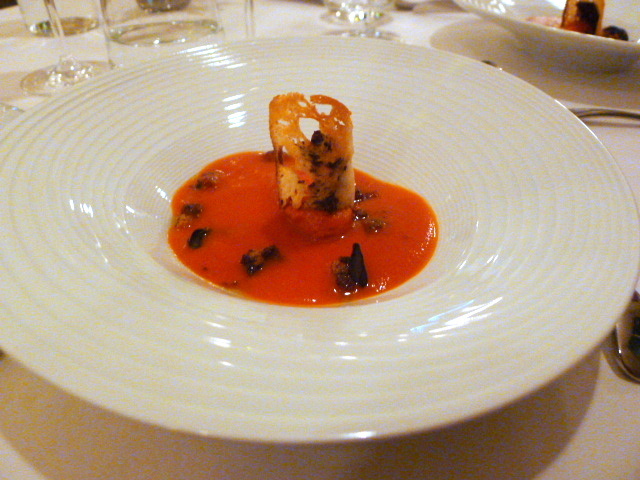 But the use of a tomato tuile was quite overpowering against the gentle flavour of the crab, and for this reason, the mille-feuille did not really work. 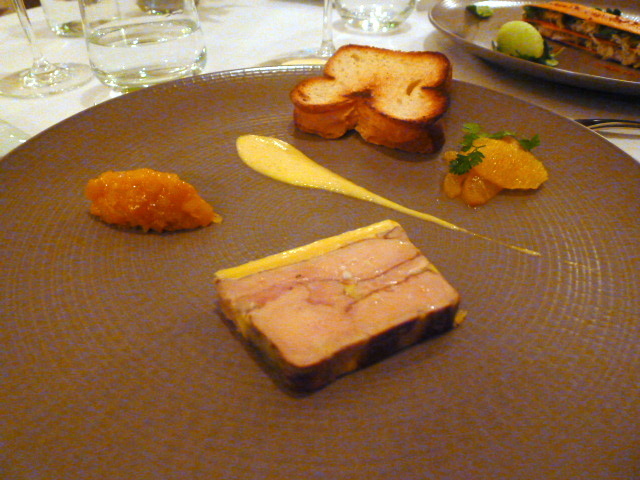 A terrine of ‘Landes’ foie gras was beautifully creamy and rich. It was accompanied by a curry chutney which was fantastic. The chutney was refined and elegant with a nicely balanced level of acidity. Also good matches were the drizzling of orange sauce and the toasted brioche which was airy and light. 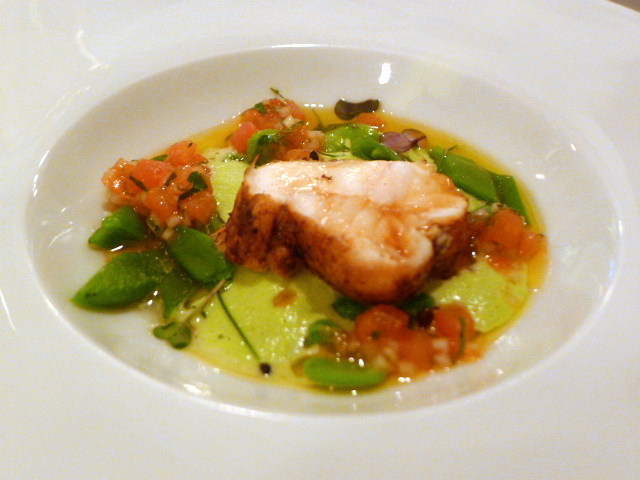 The fish course was a seared monkfish loin ‘meunière’ which was delightful. The fish was beautifully cooked, and it was accompanied by an asparagus cream and spring peas, each element of which was fantastically fresh and wholesomely tasty. The dish was finished with ‘petites herbes’ which added further aroma to the dish and a sauce vierge. Jumbo quail with honey was perfectly cooked. It was accompanied by a couscous with lemon confit that resonated with zingy goodness and which worked extremely well with the quail. To complete the dish was a lovely cooking jus and raisins. 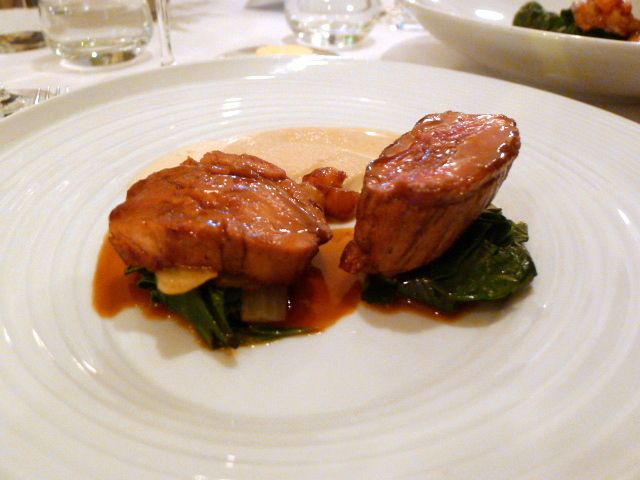 For our second main of veal – the seared rump, although tasty, was a touch chewy; and the glazed belly, a touch dry. Nevertheless, this was a decent dish with the accompanying onion soubise proving to be sweet and soft. For the final touches, there was some nicely done Swiss chard and cream of girolle. 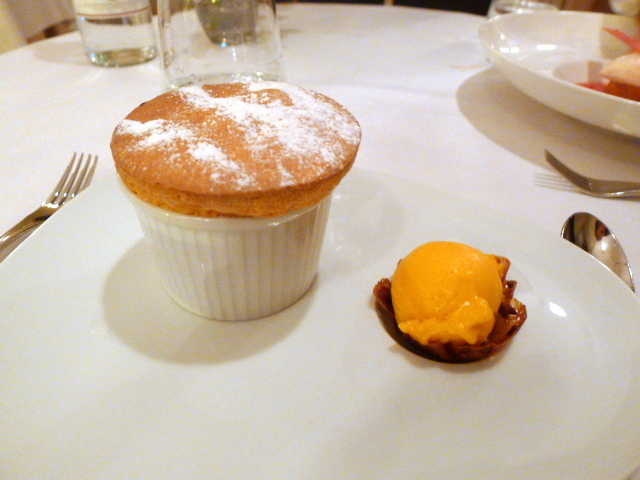 A pre-dessert of vanilla rice pudding with orange tuile was followed by a mango soufflé which did not quite work. The soufflé collapsed quite quickly and its texture was too dense. The accompanying mango sorbet (mango on mango) led to a result which was a little too sweet. 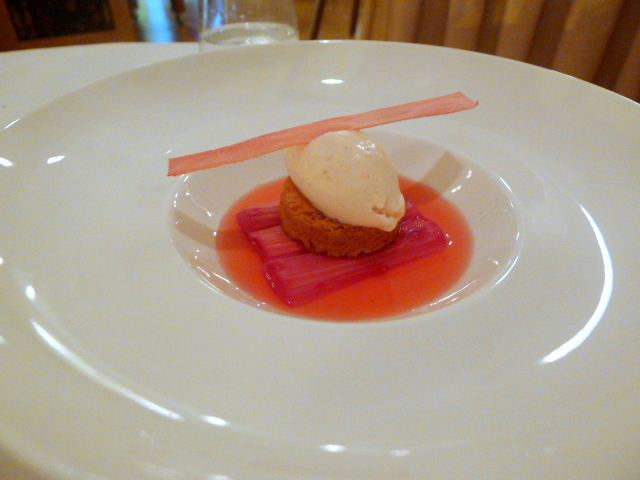 The rhubarb in a second dessert of glazed rhubarb, rhubarb and Jurançon ice-cream, and sablé Breton was a touch underdone. The wine pairings for each course were well matched. Wines by the glass and can be ordered to accompany the meal for £30.00 or for £27.50 excluding dessert wine. Morgan has held true to form with a lovely menu. It was pretty much everything that I expected and have been accustomed to in terms of his French cooking – refined and accomplished. There were a number of high points with the monkfish being a true highlight. The desserts weren’t as satisfying, but all said and done, the five course menu at Morgan M still remains good value for the calibre of the cooking and the quantity of food. Price range: The tasting menu is £52. Otherwise, £42 – £55 for three courses from the a la carte menu. Excludes drinks and service.